IMO (and others), George Massenburg ranks up there with Sir George Martin as an innovator, producer, engineer. This plug-in is just another example of the quality and musical function that is Mr Massenburg's trademark. I love using this eq on mixing, mastering and it can do wonderful things with a piano track that may be a bit "honky", brittle, or muddy. This eq is on another level, and is a MUST on all my projects. Worth every penny and MORE. 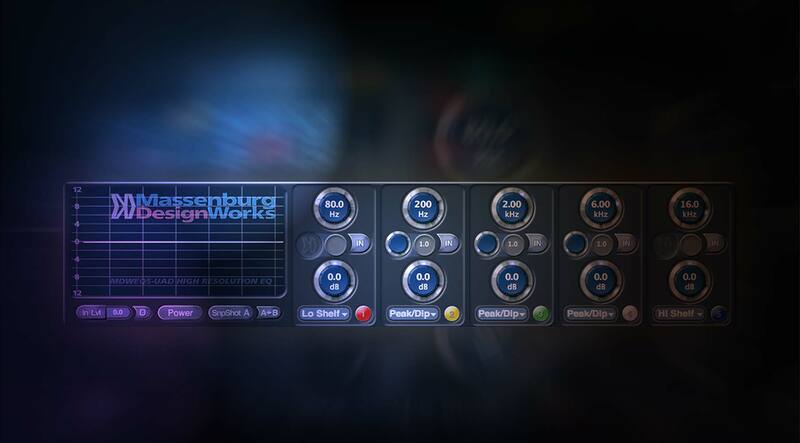 Simply put, the Massenburg EQ project with UAUDIO was a superb hit! best EQ in the market! period! Why this EQ sounds so invisible good? this EQ is the Cleanup Machine! it does exactly what it should do, and nothing else! my new goto EQ next to all the other nice character EQ's from UA...thanks! I own almost all UAD Eqs, but this is slowly but surely becoming my absolute go-to eq. Man this eq is a sleeper. It is perfect for subtractive eq'ing virtually anything and is as advertised, a colorless eq. What does that mean? When I first demo'd this plug, I was a little baffled. It didnt sparkle to me at first, but I soon realized it was because there was no saturation or distortion being added to the signal. Like many people say, it just makes it sound better, without altering the source at all. Definitely check out the demos with Massenburg himself, it will open your eyes to how this eq is meant to be used. The cleanest EQ for the cleanest results. Regardless if you choose the UAD or native version, the Massenburg EQ is simply the cleanest EQ offering in this price range and beyond. It should be twice the price (the Avid HD version is), but I'm glad it is reasonably priced on the UAD platform. It simply doesn't sound like I'm using an EQ. At mild settings, it simply sounds like I moved the microphone into a better position on the source. At extreme settings, it can sound like a different microphone selection without artifacts, imposing character or distortion. Simply put, it's always true to the source. I prefer to let the source hold the musicality and character, not my choice in EQ to compensate, and this EQ helps me nail that philosophy in my workflow. A well deserved 5 star! This is my go to master eq! It's the smoothest and most musical eq in my ears. Great to have it on the UAD platform! You can hear the Bypass working, but it doesn't sound like an equalizer. It just sounds like a better recording! Where have you been all my life? I used the MDW Parametric EQ 5 Band to remaster a record recently at 88.2kHz. The preview feature to find the band sped up my workflow. The EQ itself had a very pleasant sound, never harsh, even when boosting the very high frequencies. Massenberg's promotional video didn't say much about this EQ; I got more of an idea about his personality. The way the GUI is laid out, I found myself adjusting the frequency knob when I meant to change the gain. Otherwise very intuitive and easy to read. useful - get good results quickly; filter types and ranges are adequate. a bit limited - no output level control, no MS / dual mono. rewarding - it is NOT one of those eqs which you eventually bypass and think " this actually sounds more natural without it..."
There also is a "ghost" 3band Version of this eq which you cannot authorize at the moment in the plugin pool... ? This EQ is for surgical EQ tweaking without adding any artifacts. It's a must-have tool! I use it on every track and I love this EQ! Great EQ, easy to use, awesome charatcer and extremly harmonic! Esta EQ marca la diferencia sin duda alguna. Es capaz de dar lo que necesita y quitar lo que sobra en el master, sin cargarse el sonido ni alterar (si no quieres) el orden de las cosas. Cumple a la perfección con su cometido. This EQ is very delicate and precise EQ. I have it on each track.